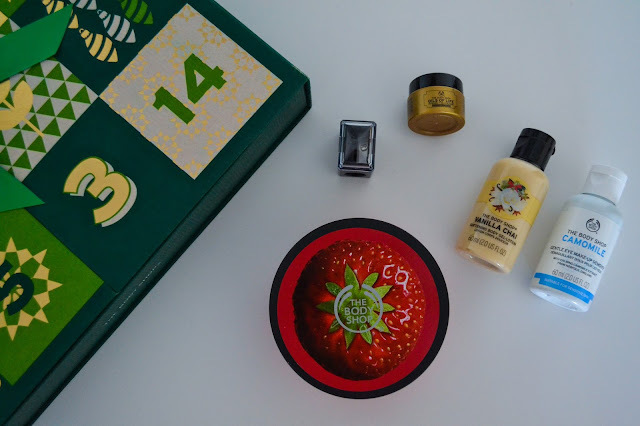 This is the third year that I've had The Body Shop Advent Calendar and originally I wasn't going to get another one this year, but at the last minute, I couldn't resist and went out and got one. As always, I'll be here forever if I give you a full run down of all the products included in the calendar, so instead I'll share my favourites with you. One thing I did notice this year about the advent calendar, is the variation in products to the previous two years. I thought the first two I had were pretty identical, hence why I was reluctant to get it again, however, they definitely mixed it up more this year and put in more tools e.g. pencil sharpener, cleansing sponge etc, as well as full sized products which I've not had before. Although I already have one, I don't have a sharpener with a lid so always need to be near a bin if I'm sharpening my eyeliners or lip liners, but now I no longer need to worry - it's super useful. I've always wanted to try some products from this range, but never got round to it, so I'm really excited to try this. It's a really handy travel sized eye make up remover so it's always useful to have! When I saw that The Body Shop had released this scent as part of their Christmas range I really wanted to try it as it sounded delicious, so I was really happy when I opened this and it didn't disappoint! It's such a lovely scent and you can always rely on The Body Shop body lotions to be very nourishing on the skin. This was the present that came on 25th December and it didn't disappoint, paired with an eye mask, this cream is just what you need before bed. The full sized version is a bit on the pricier side, so I'm really excited to try this mini before forking out for the full sized product. It's a really nourishing night cream that smells incredible. I think the night mask was a really lovely touch and always comes in handy! 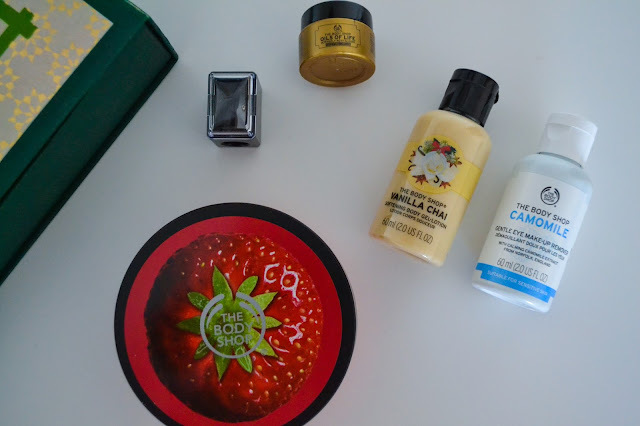 Whilst strawberry isn't one of my favourite scents, this full sized body butter was a lovely surprise as none of the previous advent calendars have had a full sized body butter before. On their own, they retail at £14.00 so to be included in the advent calendar is really good value for money. It'll always come in handy and I look forward to using it in the summer months! Unfortunately, this lip definer doesn't have the shade on it and I can't find it on the website, but it's a pinky, brown colour (the technical term!) Ordinarily, I wouldn't have been that fussed receiving this colour lip liner as I didn't own any lipsticks this shade. However, for my birthday, I received the Velvet Teddy Lipstick from MAC and this is an exact match and is ideal for lining my lips before applying the lipstick - I've been loving it! So they're my top 6 products from The Body Shop advent calendar this year. What advent calendar did you have? I'd love to hear your favourites!